İstanbul offers you a great shopping experience with its bazaars, local open markets and numerous shopping malls besides its all other beauties and opportunities. İstanbul offers you a great shopping experience with its bazaars, local open markets and numerous shopping malls besides its all other beauties and opportunities. Here is some advice and tips we think will help you during your shopping experience all around İstanbul! • You don’t have to carry cash for shopping in İstanbul. Credit and debit cards are accepted in almost all shops. • Although the history of shopping malls doesn’t go far back, there are now numerous malls in İstanbul where you can find almost everything you want. The malls are accessible from most districts and a standard shopping mall accommodates clothing stores, bookstores, technology stores and also food courts with many options to eat. • There are several streets and avenues in central İstanbul that are famous for shopping spots. Especially Valikonağı and Teşvikiye Avenues in Nişantaşı, Nispetiye Street in Etiler and Bağdat Avenue on the Anatolian side offer many famous brands, upscale restaurants and cafes. İstiklal Avenue is also a destination for shops and stores with different themes. • The historical bazaars in İstanbul are also world famous. Grand Bazaar is the top destination in this list, visited by everyone coming to İstanbul in order to feel the historical atmosphere and witness the colorful exchange there, aside from shopping. Grand Bazaar is established on a 45.000 square meters closed area and hosts around 3600 shops and stores. It is vibrant with many visitors every minute it is open and you can find carpets, jewellery as well as clothing, souvenirs and decorative items here. 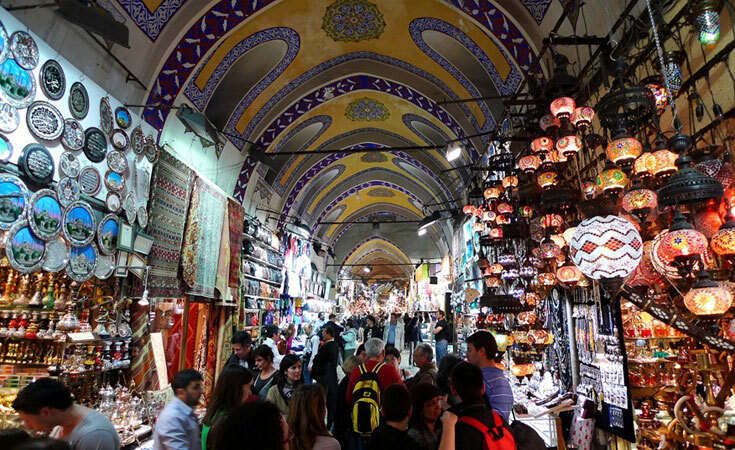 Also in Eminönü, Spice Bazaar is one other historical destination. Spice Bazaar is famous for its spice stores and herbalists and you can find dried nut varieties and meat products, too. In Arasta Bazaar, located on the northern end of Torun Street which is behind Blue Mosque, handcrafts are displayed and sold. If what you want is a handmade souvenir, the place you should visit is this bazaar with more than seventy shops. • If you are bookworm and looking for good bookstores, you can find large bookstores in almost all shopping malls. For second-hand book sellers, the favorite spots are in Kadıköy, Beyoğlu and Beyazıt. In Beyoğlu, Aslıhan Pasajı (Passage) hosts various second-hand book sellers where you can find books almost in all genres and languages. The Historical Book Sellers Bazaar in Beyazıt has a history dating back to the 15th century. It hosts 23 bookstores, 17 of whom have two storeys and waits for the book lovers. • For electronics shopping, your first stop is again the shopping malls. Almost all of them have one or more large technology stores. Furthermore, if you are looking for a cheaper option, Doğubank building is your place. Here you can find new and used electronics of all kinds with huge discounts. Doğubank is considered as one of the biggest discount centers in Turkey and you’ll probably find there whatever you are looking for.